It was a long weekend and with long weekends come exciting plans! This time, we were heading out to a fun day at sea! 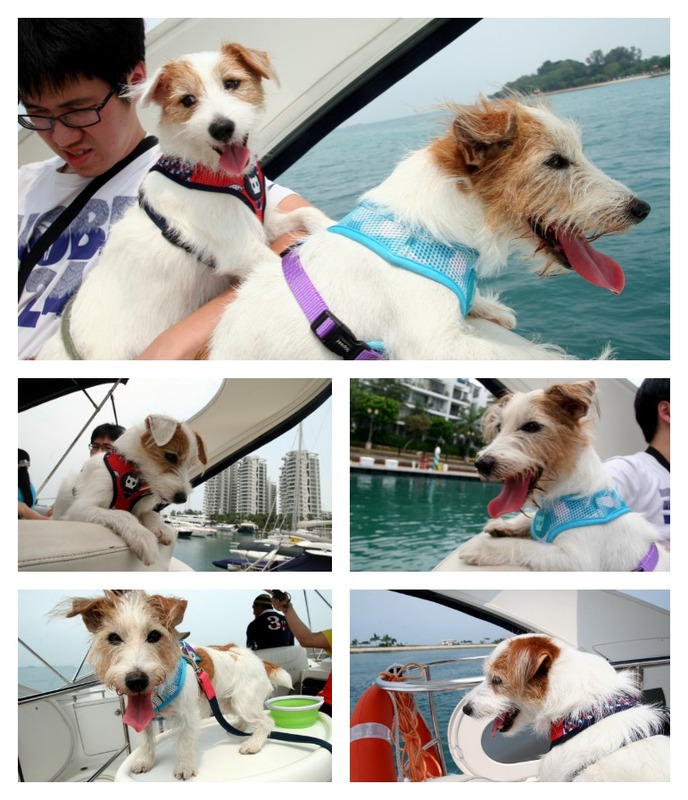 Yap, Auntie J chartered a yacht for the whole extended family (thirteen two-legged ones and three four-legged ones)! 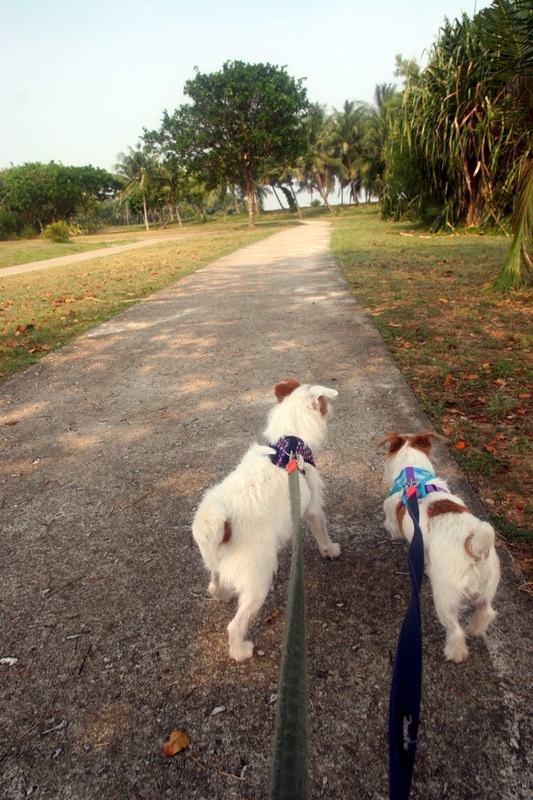 We gathered at Sentosa Cove and waited excitedly for our adventure to begin! It was a tad hot and pretty soon, we were both showing our 'Asian' eyes, no thanks to the glaring sun. We met up with Captain and he led us to the yacht. Pecan ah ma is taking her pick of which yacht she fancies. Of course, Mummy said no to everything she picked. Wondering where our yacht is. Finally, after what seemed like forever, we made it to..
our charter of the day - the Isaiah! Queuing up to get on board. Mummy knew that the weather was gonna be really nasty (hot!). But she wasn't very concerned initially as there was an air-conditioned living space on the first floor of the yacht that we could hide in. However, turned out that there was a slight miscommunication and the captain of the boat wasn't informed about dogs tagging along. So while he did allow us on board (since we already cleared it with the charter company earlier), we were only allowed in the outdoor spaces. Mummy wasn't very pleased about that at first. But when she saw how spacious the upstairs space was, she was sold. Plus, Mummy actually ended up with slight sea-sickness, no thanks to the chalky waters. On hindsight, it was a blessing that we hid upstairs. Thankfully, once the yacht set sail, the breeze was so nice that there was no way we would hide in the indoor area. We couldn't sit still at all and our parents had to keep us leashed. Especially the suicidal Pecan who has a history of leaping off high spaces. The itinerary was very free and easy and totally up to us. So we chose an island to dock at and stretch our paws on. Setting paws on St John's Island. We were given two options - either to dock at the jetty (where we can comfortably stroll to the beach) or dock at sea, leap off and swim to shore. We wanted option two for sure! Taking into consideration that our terrible mummy hates the water (what an irony) and that there were young toddlers in the entourage, we ended up walking over to the beach. This was honestly as close as it gets to having our own private beach. "Mummy, take Monkey out! Like now!" My stingy parents decided that monkey was a tad costly to be destroyed by the sea water and used Mr Spikey instead. Ah ma and her glam shot. In the midst of swimming, we also practised some kungfu. And guess what, we spotted other dogs that were out yachting too! 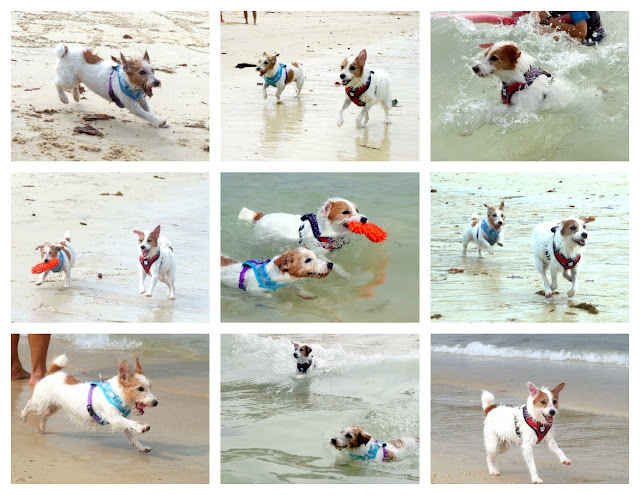 One of the dog owners actually knew Pecan and her other mummy. After what seems too short (it was a good couple of hours), we were done with swimming and headed back to the yacht to chill and relax. Sitting in front and chilling out. Scaredy Mummy wasn't very comfortable being in front so we got ushered back very shortly after. We can totally get used to the high life. Needless to say, the old lady was pooped out after all the fun. As for me, well, I stayed awake for as long as I could to say my little goodbyes to the sea. Mummy's note: It was an awesome experience! Since we had the whole yacht to ourselves (we chartered it for 5 hours), we were able to do everything at our own pace. We were allowed to come up with our own itinerary but since this was our virgin trip, we decided to follow an existing one. 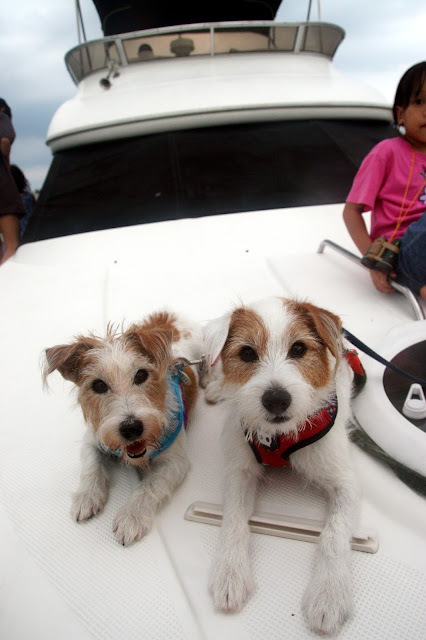 Each charter comes with a captain and a couple of helpers who ensured that everything was smooth and comfy. While there was a miscom that upset me slightly initially, the crew was really nice and friendly and that made it all okay. I'm not technically a fan of water, but we really enjoyed it and would absolutely love to do it again soon! I'm sure the two rascals can't agree more. Your blog has given me that thing which I never expect to get from all over the websites. Nice post guys! Hi! 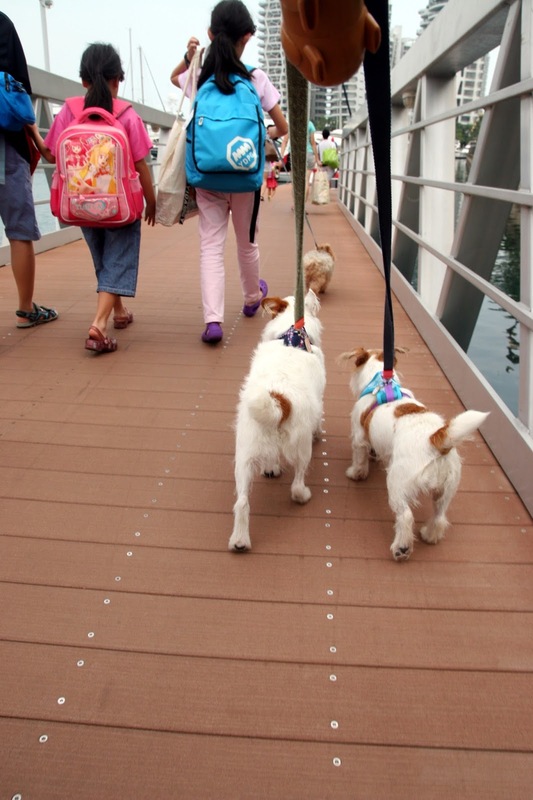 im interested to get a yacht for my gang too with furkids. Mind to share your contact? Thanks!